Hey Melrose Family readers! 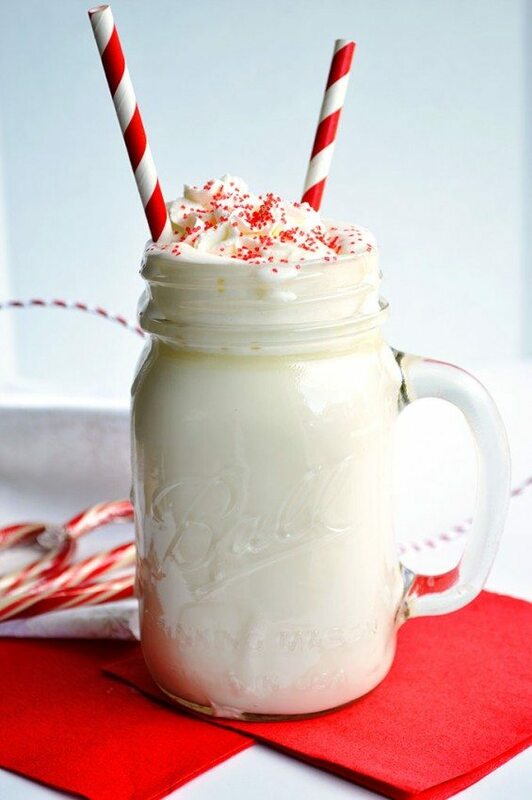 I’m here today to treat you with some White Hot Chocolate that is topped with a fluffy, decadent Peppermint Whipped Cream, with some sprinkles on top. Of course we have to have the sprinkles. This is such an easy treat to make and you can have it hot and ready to serve up for yourself or you and some lucky friends (or kids) in no time at all! It’s been so cold lately that I’ve been loving warming myself up with steaming cups of this White Hot Chocolate while lounging around in my fleece pajamas. This is such a ridiculously easy recipe, it’s not really a recipe at all. Just three ingredients into a pot on the stove, heat, and you’re good to go! 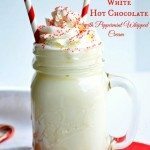 Of course this White Hot Chocolate would not be complete without the topping of this decadent Peppermint Whipped Cream. I’m slightly obsessed with all things Peppermint. And luckily for all of us, it’s the season to indulge in peppermint! Make sure you hop on over to House of Yumm to snag the quick and easy recipe for this whipped cream. Click here to get directly to the post. 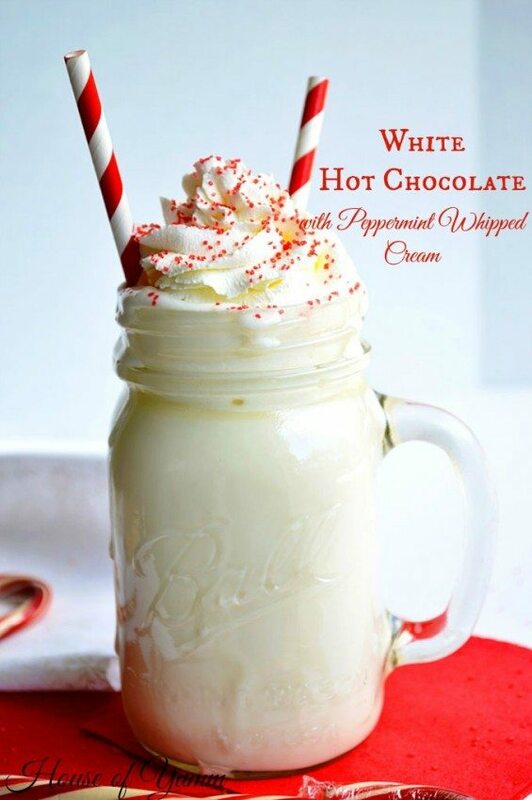 Your life (and your White Hot Chocolate) will be incomplete without it. Warm up from your head to your toes with this frothy Hot White Chocolate topped with fluffy, decadent Peppermint Whipped Cream and sprinkles! Place all ingredients into a pot and heat over medium heat. Stir while the hot chocolate melts. Once the pot begins to simmer reduce heat to low, do not bring to a boil. Continue stirring until all chocolate is melted and mixture is smooth. Remove from heat, and serve hot. Enjoy. Remember, if you need to cut calories then you can always substitute the whole fat milk for lowfat. 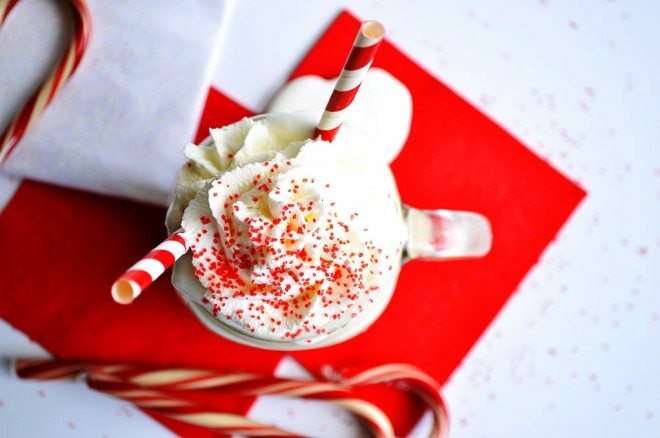 You could also skip the Peppermint Whipped Cream. Of course this also means life is a little less bright & cheery without your whipped cream and cherry on top! We’ve got you covered! Checkout some of our other favorite dessert drinks such as this amazing spiced hazelnut hot chocolate that is actually made with essential oils! For a more healthy yet still yummy option, try our Sugar Free Strawberry Slushie. Serene blogs over at House of Yumm. 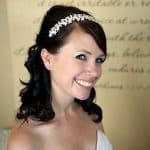 She loves cooking up treats and eats to share with her family and readers. Favorite foods include cheeseburgers and cupcakes! This hot chocolate looks amazing! Hello, thanks for posting this lovely picture and recipe! I made this last night and it was way too sweet for us. I used Trader Joes white chips, so I am hoping it will work with 1/2 the bag =) going to try it again. Also I went shopping for the masonjars like this and the ones I found at Joanns all said “Not for hot products” where did you get yours please?